about a recent event she attended. The purpose of the event was to match potential board members with nonprofits needing new board members. The problem according to my colleague? The potential board members were all inappropriate—too young, too unconnected, too little financial heft. But aren’t these often the problem with board members of most of our nonprofits? Individuals who can afford to serve on the board of a major university, hospital, large national nonprofit are mainly not interested in working with a nonprofit where the operating budget is less than the board gives at those larger organizations. And so, what you get, are those who care—sometimes passionately—about your work but may not be sufficiently affluent or influential to move your organization’s needle much. Does this make them inappropriate? Not necessarily. But it may make them very frustrating. 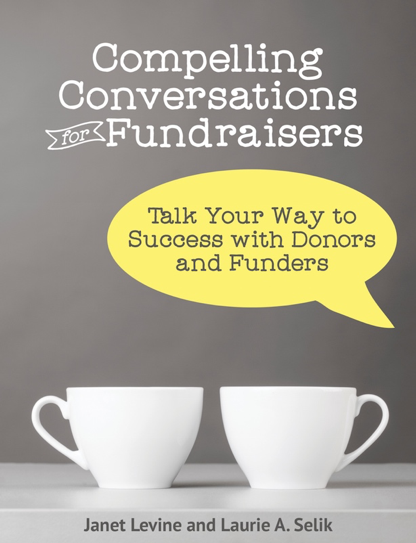 We have all come to believe our board members should be our main fundraisers. And if your board is not well connected; doesn’t have a lot to give; has no experience in philanthropy nor friends who have such experienced, they will not effective fundraisers. Unless, of course, you take the time to teach them not just what to do but also how to do it. That means working with them—and that means taking the time to get to really know them. How? The same way you get to know anyone. You spend time with them. I strongly urge my clients to meet one-on-one with every single board member to discuss board roles and responsibilities at least two times a year. Yes, it can be time consuming, but it is also well worth the time. It would be lovely if that opened a floodgate of words. But often it does not. Or the floodgate it does open is not the one you wanted. In either case, your job is to facilitate the conversation. Sometimes that means nudging the person to focus in a different direction. As you get to know your board members, you may discover that they are better connected than either of you imagined, or are more creative, helpful, willing than you every hoped. And as you truly engage them with interesting projects and offer important topics for the board to discuss (and imagine, a board meeting where the members are passionate, engaged, involved! ), you may well discover that rather than the wrong board you actually have a board that is totally and completely right for you. Janet Levine works with nonprofits, helping to train boards to be the right board. Learn more at http://janetlevineconsulting.com. Sign up for the newsletter and do contact Janet for a free, 30 minute consultation. This entry was posted in boards and tagged boards, facilitating. Bookmark the permalink.